There are many articles on VR; pitfalls of gameplay and programming, but very few – if next to none – about the actual art work process; aka what we are actually seeing as we play in a full 360 world. Allow me to give an overview of our Environment Art process for our latest game War Robots VR: The Skirmish. The first thing a 3D Environment Artist is presented with is a blank canvas; as you can see from our initial screenshot, this was one of our first prototypes; devoid of colour and decent lighting, lacking in points of interest, and riddled with bland buildings and textures taken from standard and purchased Unity asset packs. 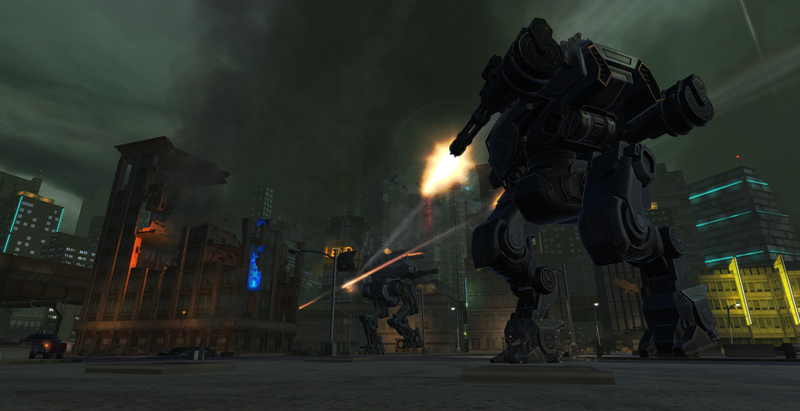 For Lead Game Designer and Producer Arthur Mostovoy, he wanted a post-apocalyptic setting, a city in the midst of War. For this our initial take was to fix the lighting and skybox (the sky texture). We decided on a dark backdrop with streaks of orange and green light, broken up into interesting shades with smoke and rain clouds. With these tweaks already we had an improvement on the look and feel. Next came our silhouette, or skyline. We had many different ideas; some talk of a Ferris Wheel or a football stadium, before agreeing on buildings that have been attacked, some appearing jagged and broken. When building a city in 3D there are basic fundamentals, especially with regard to games bordering on realism. Ask yourself what does my city need? A police station, a cinema, a church, restaurants, a park, you get the idea. These are common things we stumble on around every corner in a city in real life, and yet without them a city wouldn't feel as authentic, especially in a game setting. In our city you can find such landmarks; banks, a police station, a cinema, a park, etc. Pixonic’s Art Director Fransuaza Polishchuk was adamant that we replace all standard asset models and textures that were used in our initial demo with our own War Robot look and feel. Frans allowed us artists to experiment with different ideas before coming to a general agreement on what we believe looks awesome. This allowed us to push different ideas around, see them in demo, and edit or remove where necessary. For our models we used primarily modular based modelling; i.e. that is modelling small pieces of a building and putting them together like one would use a Lego set. We used tiling textures for this piece, many assets sharing the same texture and focusing on Unity's integration of PBR materials. For some of our signage we used an emissive texture. Some key models were treated as individual pieces, with individual textures. For example; the cockpit, built by Project Art Lead Dmitry Alexandrov. First he used initial placeholders, testing how the cockpit would look in a 360 setting, then modelled a High Poly asset and textured in Substance Painter. 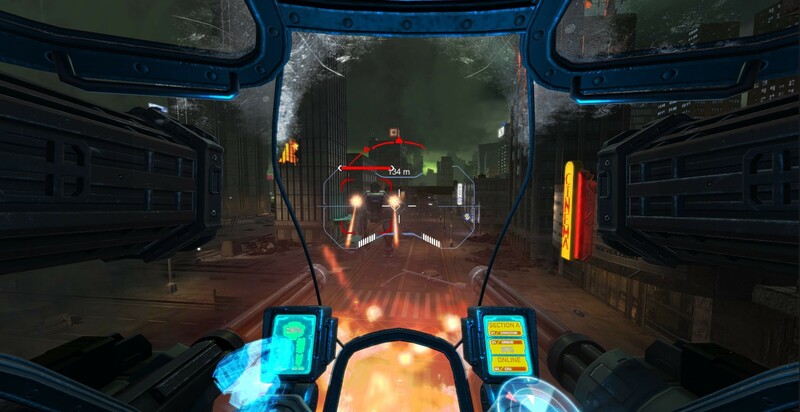 You’ll notice the frame for the cockpit is relatively thin, as players should not have their view, including their periphery, of the environment obscured by a thick frame. With Robots this size, averaging 15 meters in a realistic setting, composition is key. 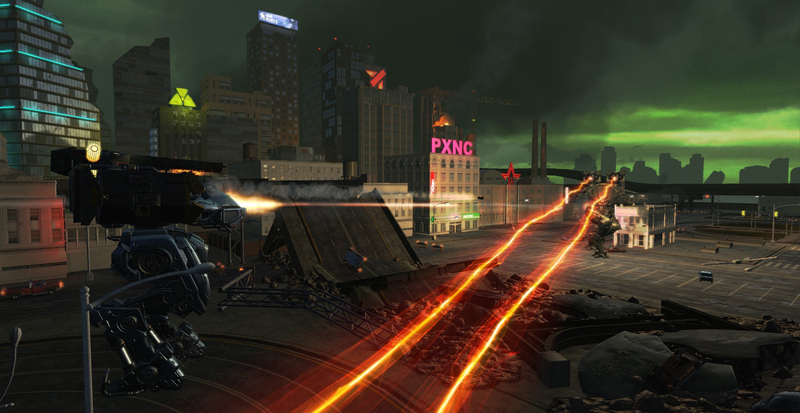 All the buildings have been moved and positioned to compliment a nice flow of gameplay. 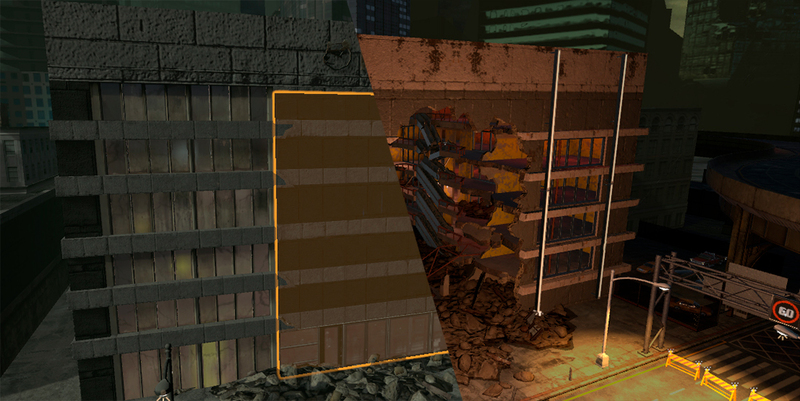 For one of my set pieces, the Journalist Building, you'll notice that all the damage is on the right side of the building, subconsciously pulling the player to head towards the right side, as this is where the action is coming from. The difficulty of a three-sixty degree setting is getting our players to look where the action will take place. With VR, the player has complete control, so how do we get them to move and explore in the areas that we want them to? By using lighting and effects, interesting animation pieces and robots attacking from different angles, we are able to guide our pilots along smoothly so that they feel the events are really unfolding in real time. Though our city is in chaos, some lights still work. For lighting the city we drew from primarily three sources of reference; Rocksteady's Arkham Knight, the live action film Ghost in the Shell, and of course Blade Runner. What resulted is a mix of neon colour, with just a touch of futuristic. You'll notice loads of Easter Eggs in our city's advertising. It's worth mentioning that we debated fiercely on the ending for this piece; the setting went through a metamorphosis of expectation and what is practical for our deadline and resources. For example, we had ideas about a large temple like structure that the Robots will battle around at the finale. 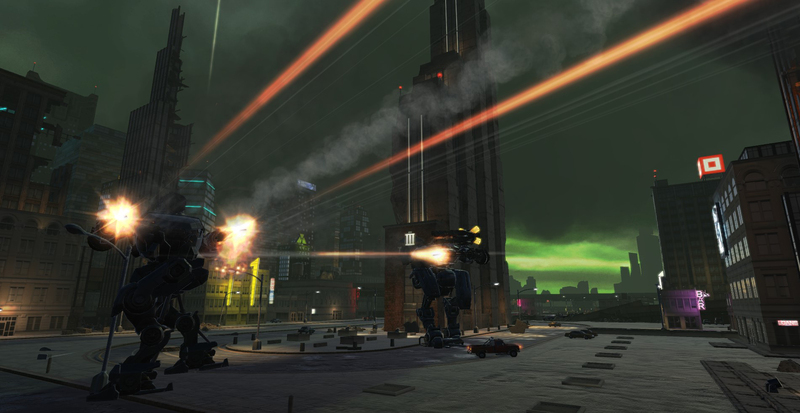 This idea, though it sounds cool, doesn’t coincide with the War Robots branding of believable sci-fi environments, and it would be odd for a player to suddenly leave a believable cityscape and find himself next to a large temple. Other ideas that weren’t included were less severe and were more a question of time and resources, for example; the broken freeway. Players would have been instructed to destroy the freeway blocking their path by themselves. For the Shipyard finale, while paying homage to our PowerPlant map from War Robots mobile, I pulled reference from Iron Man 3 and The A-Team film. 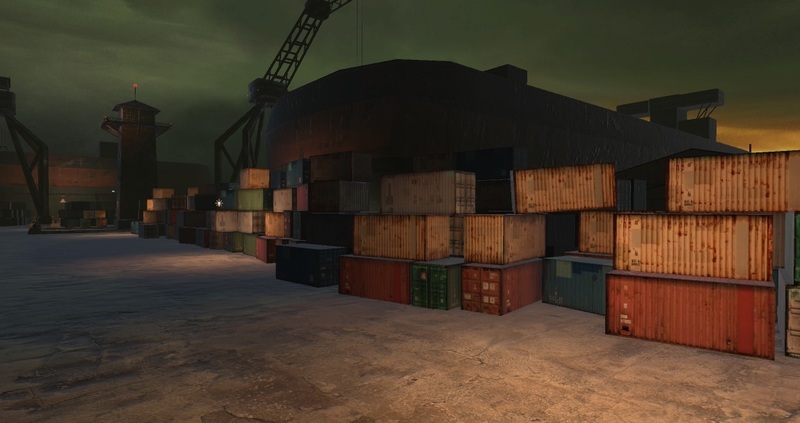 This idea of a shipyard has a final destination feel to it, one that I feel the player can sense; I am contained in a containment yard, I'm either going to win or die here. The multi-coloured containers take away any blandness that a corridor of this length could present. Also, even though the player is boxed in, they still have room to manoeuvre. There is a strong relationship between level design and environment art; focus on the big picture (the big reads, as Artists call them) and then focus on the small details to refine your scene. Some, if not all, important pieces should be recognisable from a distance, especially by silhouette. It's worth mentioning to other artists aspiring to make interesting environments; even though the containers in this image are repeating assets, it doesn't mean they have to be perfectly aligned. It adds more character and realism to move each prop a few degrees off centre, or play with moving them forward or back an inch. It's the difference between an interesting scene and a boring one. Also do not be afraid to play with different colours and strengths of light. Sometimes the shadows cast from the most unlikely of places can make for an interesting environment. Obviously with weeks (or should I say months) of polishing, fixing textures, baking lighting, adding effects and sound design we now have our end result. We are delighted to showcase our talents in War Robots VR: The Skirmish, and we hope you enjoy playing it as much as we enjoyed making it.